I have a two recipes to share with you on the blog this week - centered around warm, delicious fall dinners. 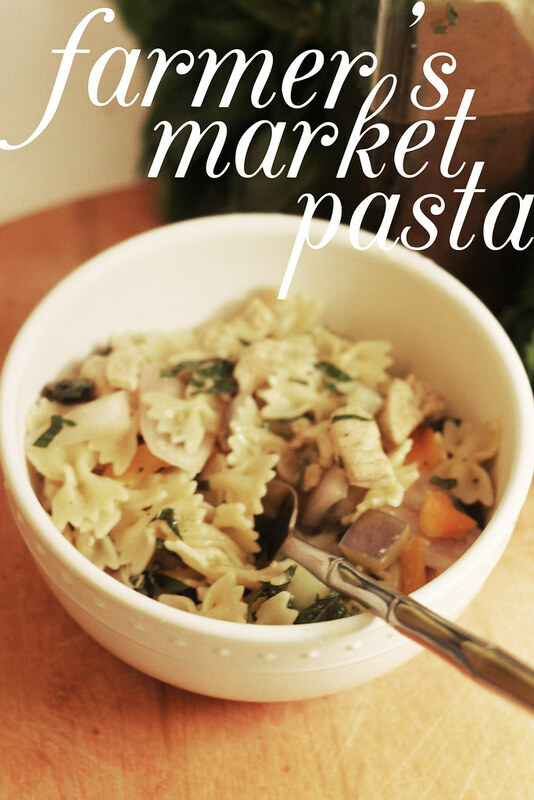 The first is a super easy pasta salad with customizable ingredients perfect for weeknights when you don't have much time, energy, or drive to make a hearty meal. This recipe is a great improvisational recipe where you can add whatever veggies (or fruits) you love and it'll taste fresh and delicious no matter the combo. We went to the farmer's market and bought gorgeous purple and orange bell peppers and bunches of the last of the summer herbs for this particular recipe. 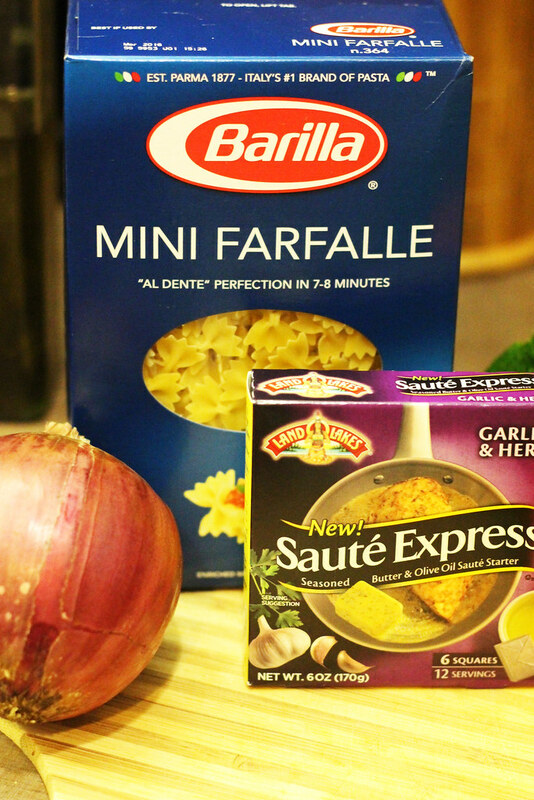 Keep reading for the recipe for this easy pasta salad with a bunch of farmer's market fresh herbs, veggies, mini farfalle, and Land O’Lakes Sauté Express® Sauté Starter (found at WalMart). The recipe below makes enough for two with a day of leftovers. First chop up your red onion and two bell-peppers roughly. You'll want these veggies to be substantial enough to make up a key part of the salad. Set aside. 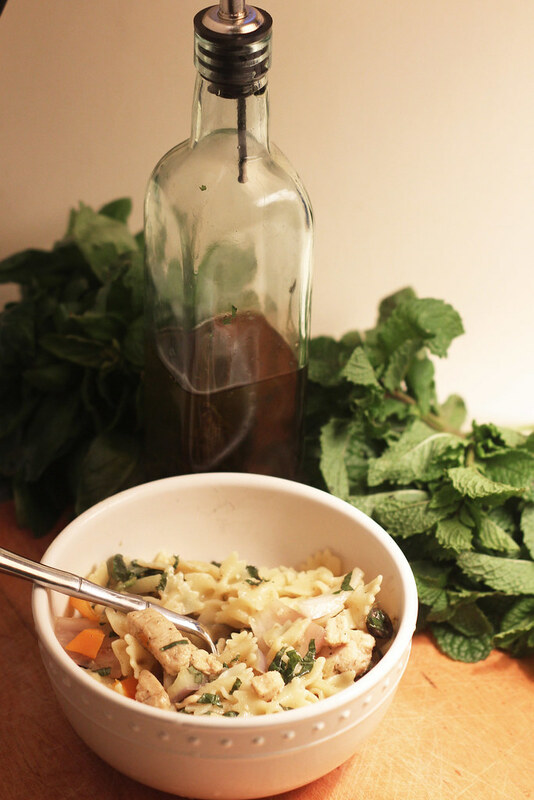 Chop your basil and mint (we use herb scissors) and reserve. Cube your chicken thighs or breasts. 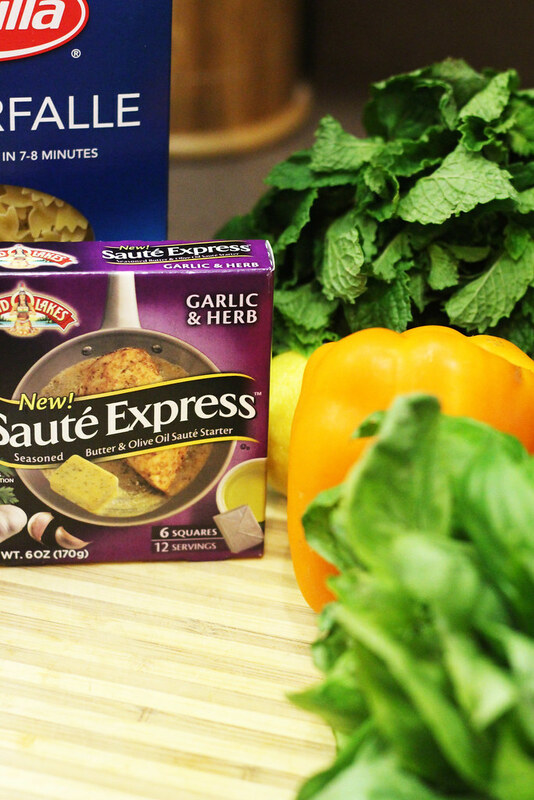 Heat up your non-stick frying pan, adding 1/2 a cube of Land O’Lakes Sauté Express® Sauté Starter (butter and olive oil with herbs that's exceptionally delicious). Toss in your bell peppers and onions and saute for about 5 minutes. Remove the veggies and reserve. Add in another 1/2 a cube of Sauté Express®Sauté Starter, 1/2 of the juice from your lemon into the skillet and your cubed chicken and saute until fully cooked. While chicken is cooking, cook pasta according to instructions on the box with some olive oil and salt added to the water for taste. 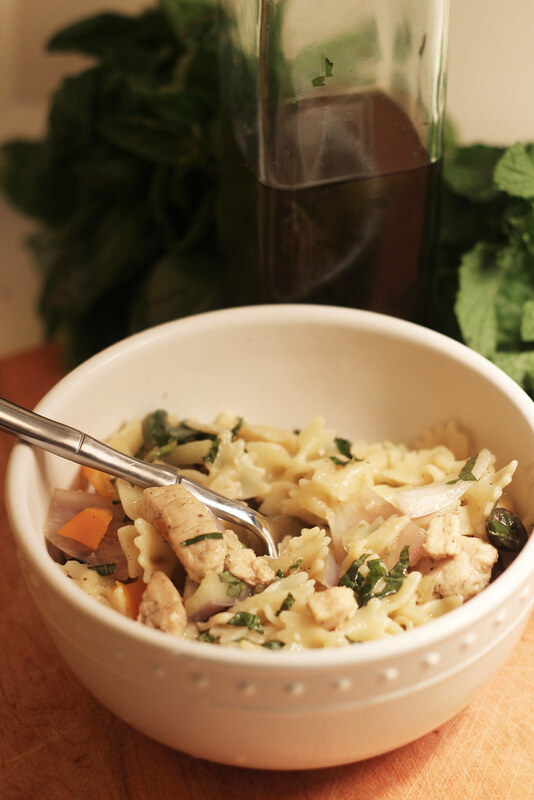 Once both chicken and pasta are cooked, transfer them both into a large bowl and add in the sliced olives, veggies, juice from 1/2 a lemon, 1/4 c. chopped basil and mint, and finally olive oil, salt, pepper, garlic salt to taste. Enjoy warm or chilled as leftovers. I wish I could have pasta! I love this whole idea though, I may make it for my next family gathering. I always love a good pasta salad. Thanks for the recipe! yum! this looks soo good!! I just love pasta. And pasta salads. And this pasta salad. I love pasta, and this one looks very healthy. This would be great for my boyfriend. i'd love to try this without the chicken (i'm a vegetarian!) looks delicious. Looks so good! I'd definitely try it!